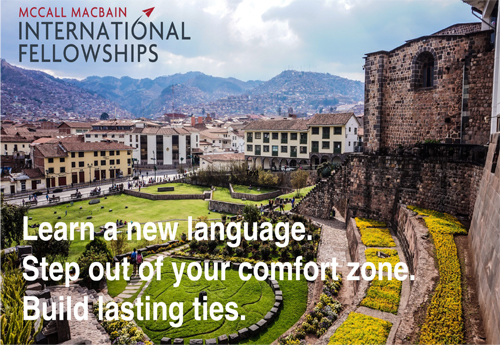 McCall MacBain Foundation partnered with McGill University to award 10 McCall MacBain International Fellowships for the academic year 2019-20. Valued at up to CAD $23,500 each, these fellowships enable undergraduate students to spend a year abroad studying a foreign language, doing an academic exchange, and pursuing an internship. have not left Canada to participate in a travel, work, volunteer, or study abroad experience independently (i.e. without parents) in a new language or culture for eight months or more during the last five years.